Lyubov Chernukina’s husband, Vladimir made a £160,000 donation to the Tory Party that won her the chance to play tennis with Prime Minister David Cameron and London Mayor Boris Johnson. The Conservatives made sure he wasn’t in Vladimir Putin’s entourage and decided to keep the money. Despite deteriorating relations between Russia and the West, British Prime Minister David Cameron intends to fulfill his promise to play tennis with the wife of a Russian who made a donation to the Conservative Party. Russia’s former Deputy Finance Minister Vladimir Chernukhin won the chance for his wife Lyubov to take to the courts with Cameron at a fundraising ball for the Conservatives’ election campaign. He contributed £160,000 to the party, the Financial Times reported. Members of the Labour Party asked why the Tory leader accepted money from a person who used to have ties to the Kremlin. “It looks like Cameron wants to have his caviar and eat it,” Labour Party politician Chris Bryant said. At the same time, Johnson said, "it's important that we don't lash out with measures that would simply attack all Russians everywhere”. The party’s official position is that all reasonable checks are conducted on donors and that it will not return money simply because the donor is a Russian. A representative of the Conservative Party said that Chernukhin had not worked in the Russian government for a decade and was not in Putin’s entourage. 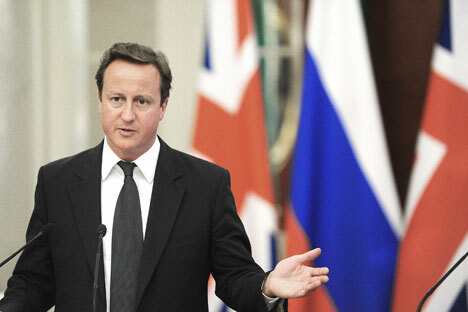 Cameron decided that he would fulfill his party’s promise, the aide said.